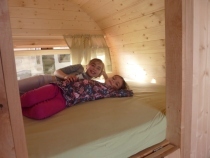 The five barrels are ideal sleeping accommodations for people who like to travel light. 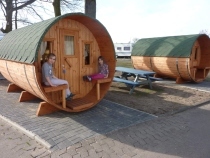 At a size of 3,30m x 2,00m or 4,10 m x 2,38 m they offer a cosy sleeping area, a living area with plenty of storage space, and benches on the outside. The camping site's sanitary installations are within easy reach, and for colder nights you can rent a space heater.